It was with great excitement and anticipation that a group of established and aspiring fish scientists departed on a survey of the main stem Doring River during the week of 21-26 November. Not only was there the promise of great scenery, sleeping under the stars and Bruce Paxton's camping cuisine, there was also some serious work that lay ahead. The Doring River had not been surveyed for almost a decade and there were several questions regarding the fish community of this fairly pristine river that needed answers. 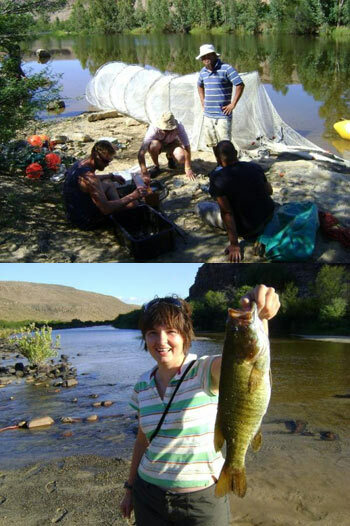 Following a very disappointing March 2011 survey for Clanwilliam sandfish (Labeo seeberi), we were desperate to find some healthy sandfish populations persisting amongst the wave of bass and bluegill that had slowly but surely overwhelmed the Doring River over the past 80-odd years. What followed however was not the happy story that everybody was hoping for. Four days of intensive sampling using mainly fyke nets and electrofishing and not a single indigenous fish! Then, on day five when everyone was losing hope of seeing the mystic sandfish, three adult fish were caught in a fyke net. These individuals were in a very healthy condition and had possibly spawned during the past spring. There was also an unexpected surprise on the last day. While driving home from the Biedouw River valley near Wuppertal (close to Clanwilliam), a few small fish were observed in the Biedouw tributary. Some underwater photos taken by Riaan van der Walt, freshwater stewardship manager for Cederberg, revealed these fish to be juvenile sandfish. This indicates that despite the results of our sampling efforts, low numbers of spawning adults were indeed present in the Doring River. Sadly however, taking into account the numbers of predatory alien species present, very few of these juvenile fish will survive to adulthood. What makes the results of this survey even more distressing was an account of a farmer who we encountered during the survey. This gentleman had lived on the Biedouw River for many decades and told of the days when migrating sandfish were so abundant that the river turned a golden colour due to the masses of fish migrating upstream to spawn. I'm not quite sure what it is about the Clanwilliam sandfish that makes it so special. What I do know is that the survival of this magnificent fish lies in the balance due to the short sighted and careless actions of earlier generations and that it is up to us, here and now, to intervene to ensure the survival of this species for the future. With this in mind, a conservation plan is in the process of being developed and will be implemented in 2012 in a collaborative effort between CapeNature and Northern Cape Conservation.